Recently a black family shared their story about their decision to donate their embryos to another family on Hello Beautiful online. “We had the family size that we desired, and felt as though since those lives were hanging in the balance, we would bless another couple with the same experience we had. We could not bring ourselves to donate them to science when another family could be blessed with children just like we were,” said the donor mother. 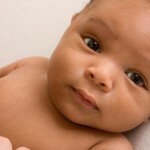 For more information about embryo donation visit Snowflakes.org.